"Nothing is given or granted. You must have your goals and try hard to achieve these goals with persistence and patience despite the difficulties and possible failures." Employing perseverance, motivating your employees, dreaming and hardworking: These values and continuous pioneering efforts helped Alexandra Pitta-Chazapi develop the family honey producing business into one of the most dynamic and innovative enterprises in the world. Having been chosen as one of the forty most important women entrepreneurs of the world, she continues to manage the Attiki Bee Culturing Company as Vice President of the Board and Managing Director responsible for the Commercial Sector, while she also passes on her business knowledge by mentoring ambitious young women who wish to follow in her footsteps. Alexandra Pitta-Chazapi has not only proved that Greek women have entrepreneurship in their DNA; she has significantly contributed in promoting Greece by offering the world one of the country’s most exquisite goods: the Greek honey. Everything is achieved by hard work. And nothing is given. We had a very democratic system. We had an elected student president both in our class and in our school who was respected by students and teachers. We also learned to have rules and follow them. 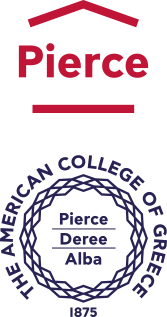 THE BEST SCHOOL: I am proud that I studied at PIERCE. It gave us very good education. We had very good teachers. It was a school with an exceptional atmosphere and gave us deep knowledge but also broad knowledge in many things. Except the obligatory lessons we had art and music lessons and we learned to love theater, music etc. A theatrical performance of ELECTRA by Giraudoux with Katerina Thomadaki and Katia Dandoulaki – if I remember well; the classical, and. I was also enthusiastic with lectures from our astronomy professor Mr. Chasapis. The Monday morning gathering when the President of the College, Mrs. Stewart, wished us for the new week; then, we would all together sing a Hymn from the Hymn book that was on every seat of the theater. This is something that the older alumni still remember. Also, on Friday afternoons we had a very good program in the theater again. I liked volleyball and I played in my class team which had earned the internal volleyball first price twice. I also liked the athletic spot and I stayed every Friday for athletics after the end of the lessons. Mr. Kravaris, my mathematics teacher for 4 years, who taught us algebra and geometry and made math my most favorite lesson. I had a 20 in both lessons and I achieved very high grades at the University entrance examinations. I had frontistirio only for the summer period before the exams as the school did a very good job. I entered the ASOEE 7th in the rank. A very good teacher was also Mrs. Koulouri who taught us geography. And we had the best class advisor Mrs. Krokodilou who was a symbol of the school. I have kept in touch with four classmates. With two of them we were also together in ASOEE and we studied together for the entrance examinations. Q.: How did PIERCE help prepare you for your professional life? I lived with a fully protective family when suddenly I lost my favorite father and everything changed rapidly for me. I strongly believe that the school prepared me to stand on my feet. It was the best help for my professional life. The advice I remember most is deeply connected to PIERCE: Just before going to High School and after having succeeded in all 3 exams (oral, written and High School entrance exams) my father and I visited PIERCE to meet the Principal, Mr. Ftyaras, in person. I tried to shake hands with him, but you can imagine how shy and loose my handshake was. Mr. Ftyaras then told me that the handshake must be firm and strong (not of course very strong) as it shows your character. He showed me again how to shake hands. It is something I still remember after so many years. Q.: Who inspires you most? I think Mrs. Krokodilou inspired me. She was very strict but very fair. We had some rules and we knew that not following the rules would mean punishment. But her way and attitude inspired us. I remember an incident: Back in the 3rd grade, Mrs. Krokodilou was supervising us during exams. She told us that we are responsible people and she would leave us without supervision because she was sure that we would not cheat. We discussed about that for a little, then she left us without supervision and she returned when the time had passed. No one had dared to cheat despite her absence. Nothing is given or granted. You must have your goals and try hard to achieve these goals with persistence and patience despite the difficulties and possible failures.